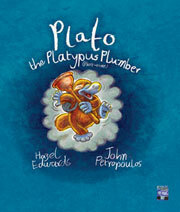 Title:"Plato the Platypus Plumber (Part-Time)"
Plato, an eco-warrior, and part-time plumber fixes watery problems like leaking taps, but he also fixes grumpy people with jokes or a smile spray. His tool kit is legendary. Despite ferals along the creek bank, Plato is on call to help Zanzibar and his family who are renovating their old creekside house. Lively and colourful illustrations are interspersed throughout the story. Aimed at those interested in imaginative problem solving, this book will appeal to boys and girls, keen on animals, nature or wildlife. And it also asks watery questions about climate issues, such as drought. For students studying LOTE, comparing the English and Spanish or German versions of the picture book can be productive. In the same way, comparing print and e-book formats. Channel 31's Writers' Notebook interview about the process of how a writer gets ideas and works with an illustrator. Collaborating on Plato: article from Working Writer. How did the school prepare for the launch? Meg Baxter, the Early Childhood teacher and her enthusiastic staff had organised a special ‘mud’ cake iced with a replica of the cover as well as ‘muddy’ chocolate milk. SFX of water noises. Charts of platypus facts, and even an story house, surrounded by recycled branches (in the spirit of the story) with an author chair for the ‘first’ reading. To the side was a ‘creek’ with platypus shapes. The children had all created their own plumber tool kits in mini cases. Teachers had prepared the children well. What else was unique about the preparations? There were platypus prints leading into the room and up to the pile of Plato the Platypus Plumber (part-time) books. Can you tell us about the author signing? So Indonesian teachers helped with typed slips of children’s names for autographing. Many are KTC s Kids of the Third Culture, where parents may be nationals of different countries and the child born or schooled in a third. But stories cross all cultures. Sounds like the teachers were very resourceful, Hazel. And in your book, Plato helps Zanzibar to develop these same kind of problem-solving abilities. Why do you think it’s important for children to have these skills? Being willing to try new ways of solving problems, even if you get it wrong occasionally, is the only way we learn. It’s okay to do things differently. What was your favourite part of the launch? For me the special pleasure was that once I’d talked about how a book was also created by the reader from the clues given by the illustrator and the author, the children sprawled on the rug and all read the book for themselves. ‘Mine is the first Plato book signed in the whole world,’ said one little boy as he sat down to read. Kids Book Review : Interview about author workstyle and recent titles including Plato. Bugnews 'His business card states “Pipes, taps and grumpy people fixed”.